Four Seasons Resort Bali at Sayan is the resort with an architectural marvel, built beneath a huge, man-made lotus pool that seems to float among the treetops. Below, the dining and bar areas look down upon a fast-flowing river….the view from our villa encompasses the thick, lush green of the rainforest. 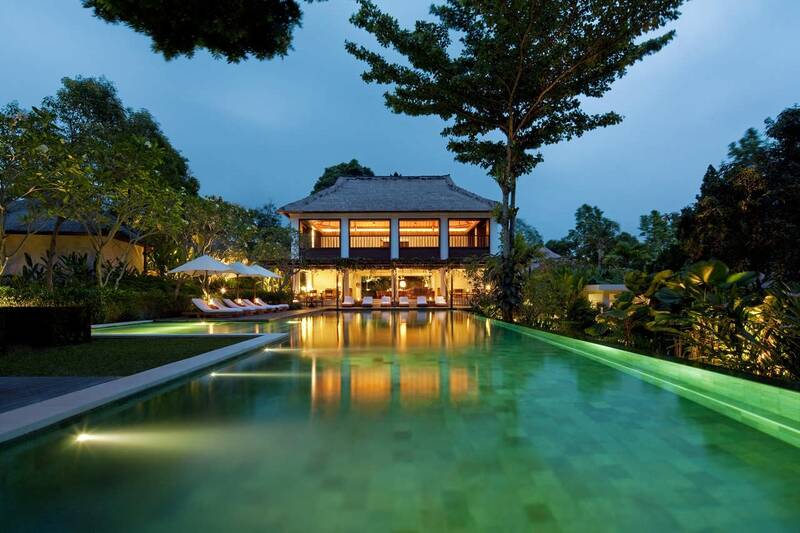 Beneath a lotus pool floating above treetops and Bali’s sacred Ayung River, discover a few dozen enormous suites and private villas nestled in the jungle. Spa magic with the secrets of the East. Eclectic dining at the breathtaking valley’s edge. In a world of celestial peace, Four Seasons offers 18 expansive suites and 42 absolutely private villas that epitomise the ultimate in style and comfort. All of the guest accommodations reflect their exotic surroundings, with rich teak wood furnishings and colourful hand-loomed fabrics. Generous bathrooms feature blue or green terrazzo tiles, black granite countertops, a double vanity with Italian fixtures, a deep soaking tub and a separate glass-enclosed shower. Guests who wish to remain connected with the outside world may take advantage of the multi-line telephones with voice mail and wired or wireless Internet access within every suite and villa.